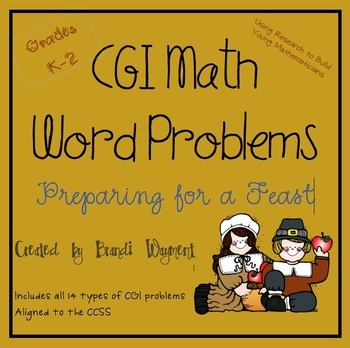 This product features word problems about Thanksgiving in all 14 problem types for Cognitively Guided Instruction (CGI). 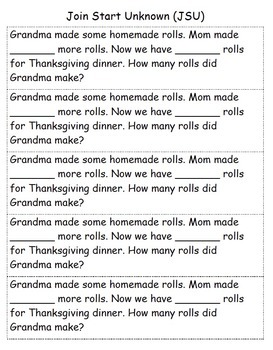 These problems are perfect for grades K – 2 since you choose the actual numbers for each problem according to your students’ needs. 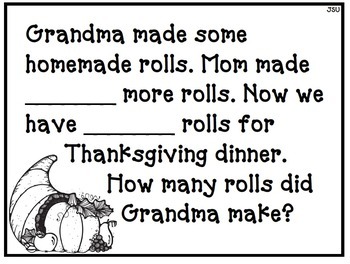 Differentiation couldn't be easier! 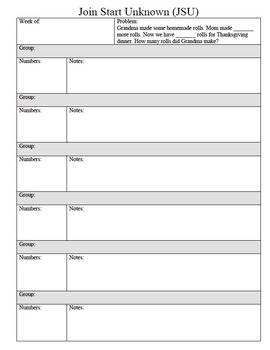 For each CGI problem type, the problem is typed up in a large one page version, a cut and paste version for student notebooks with 5-7 per page and a teacher record sheet for each problem that can be used for small group planning and anecdotal notes. Each page has an abbreviation for the problem type and an abbreviation key is included. Carpenter, Thomas P., Elizabeth Fennema, Megan Loef Franke, and Linda Levi. 1999. Children’s Mathematics: Cognitively Guided Instruction. Portsmouth, NH:Heinemann. Wedekind, Kassia Omohundro. 2011. Math Exchanges: Guiding Young Mathematicians in Small-Group Meetings. Portland, ME: Stenhouse Publishers. •	Look for the green star next to my store logo and click it to become a follower. You'll now receive email updates about this store.